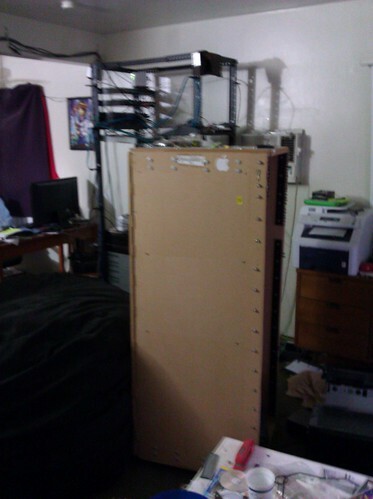 I've had a 19" rackmount for holding computer equipment since I built one my junior year of college. I've found it to be very handy and to scale well over time and as my equipment needs have changed. Lately, however, I had been annoyed with the difficulty of managing cables in the case that I'd built and with the accessibility of the back of machines. Doing some looking around, I found that Amazon had gotten into the business of selling rack equipment. Like other things, their prices were extremely competitive and for $325 (with free shipping), I eventually decided to replace my aging medium density fiberboard rack with something a bit sturdier. The new rackmount came in a surprisingly compact box. It was 7 feet tall, but the cross-sectional area was less than 24 square inches. Of course, this box's density was very high and the "as packed" weight was 68 lbs according to make bathroom scale. Assembly was rather easy; the new rack came in about 8 pieces which are held together with heavy-duty bolts. Though it says that it should be assembled by two people, I had very little trouble assembling it by myself. Actually assembly took less than an hour. Transferring equipment from the old rack and clearing floorspace for the new one took most of my effort. Unfortunately, there was one thing that I wasn't adequately prepared for with the new rack. 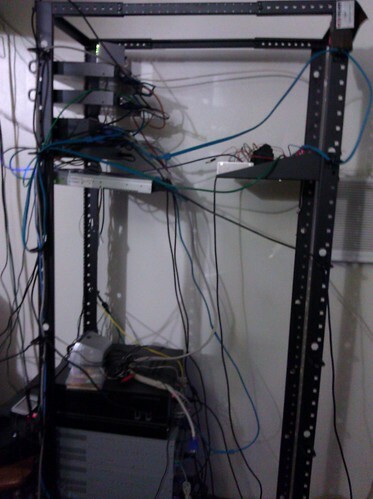 My old rack was less than 35 RU in total height. The new rack is 45 RU. Adding in the height of the non-usable top and bottom areas, the thing is over 7 feet tall. With all that space, I installed several of the smaller machines near the top. Despite having dozens of computer power cables, I only actually have about 2 that are longer than the standard 6 feet. As such, I have a couple of uninterruptible power supplies on a stool until I get replacement cables. I also learned during the dismantling of the old rack that I had a lot of redundant equipment. I had at least 7 ethernet cables that were only plugged in on one end lying around in the rack. Presumably, this had been from me replacing equipment and never adequately cleaning up after. I also discovered that I had at least 10 uninterruptible power supplies. Given that I only have 8 machines in the rack, this is a bit of overkill. I know that some of the have died, but I never actually labeled which are bad. I've since identified one as definitely bad, but I probably won't know for sure about the others until the next power outage. 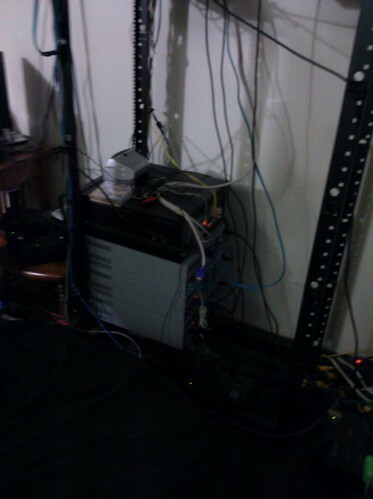 Incidentally, I disassembled the old rackmount and put it in my closet. I'm not sure what I'll end up doing with it, but it is too big to move around easily and has just enough sentimental value that I'm reluctant to toss it right now. Maybe we'll see when I decide to move.